Master Cleanse Poop! What should it look like? How will it be? Ah poop. It's fun to use such silly words to describe such unpleasant topics. 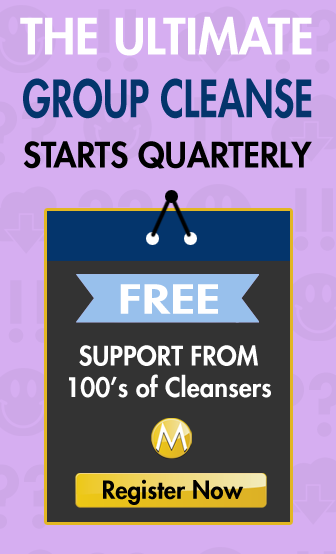 Master Cleanse poop, stool, bowel movements, BM's, or whatever you want to call them are a critically important and telling process of the cleanse. Your Master Cleanse stool, or bowel movements will vary over time during the course of the cleanse, eventually being mostly liquid and will contain some old, solid waste matter from your colon, digestive track and from the mucus membranes from each and every deep dark corner of your body where toxins were sequestered to as to prevent from causing more damage to the body's systems. Ease-In Poop Guide: If you choose to ease in you will not see much difference in your poop as you're still eating foods. But, by doing the Ease-In, you will quicken the transition from solid to liquid stool more quickly during the Lemonade Diet days 1 through 4. Lemonade Diet Poop Guide – Day 1-4: On day 1 of your lemon juice cleanse you will take your laxative the night before you start your cleanse (cleansers eve), on the last day of your (optional) Ease-In or regular eating. You will likely still have 1 maybe two “normal” bowel movements due to the transit time the food you ate the day before. Day 2 however is the biggest change in this stage. Lemonade Diet Poop Guide – Days 4 and Beyond: By day 4 you might be saying to yourself (hmmm), my poop is yellow. Is that normal? And the answer is yes. It's a yellow water poop with a few floaters here and there. Well many, many floaters if you're really looking. Ease-Out Poop Guide: On day 1 of your Ease-Out, the orange juice day, you may get your first natural, solidish bowel movement without using the Salt Water Flush or the Herbal Laxative Detox Diet. It will be squeezy and scattered and light brown even orange a little (not surprisingly). This stool will be loose. Day two, it will all come together (literally). Your poop will gradually become more normal. During our Master Cleanse, poop acts as our most obvious elimination vehicle or detox system our body uses to remove waste and toxins from our physical body. Sweating: Using our largest detox organ, our skin. Try steams, light exercise, infrared saunas to sweat more. Defecation: Poop! Yay poop. Just make you poop or your cleanse is back-firing. You need this elimination vehicle cause you got a lot of toxic deportees being detained and lined up for removal. In order to ask the question, what should my poop look like, begs the question, what are you doing looking at your poop in the first place. Well it's natural. Most animals will stick their noses in deep to get a good whiff. Some will even eat it (I am looking at you dogs and monkeys). They do this to monitor their health. They can tell if their well, or what type of disease they have by their poop. We all need to be better poop doctors and at least know what out poops should look like (see the graphic below). In most cases you'll get bored really quick because all you'll ever notice is that your poop is a yellow water. My Poop is Yellow Water. Is that Normal? Seriously tough, you drinking a lot of lemon. Which is yellow. You're not eating solids (also know as liquid water). So ya your poop should be yellow water. Constipated (Non) Poop: People complain they are constipated. First of all, of course you are. You're not taking fibre so you won't produce a typical bowel movement. That's why we do The Salt Cleanse as well as the Senna detox tea. 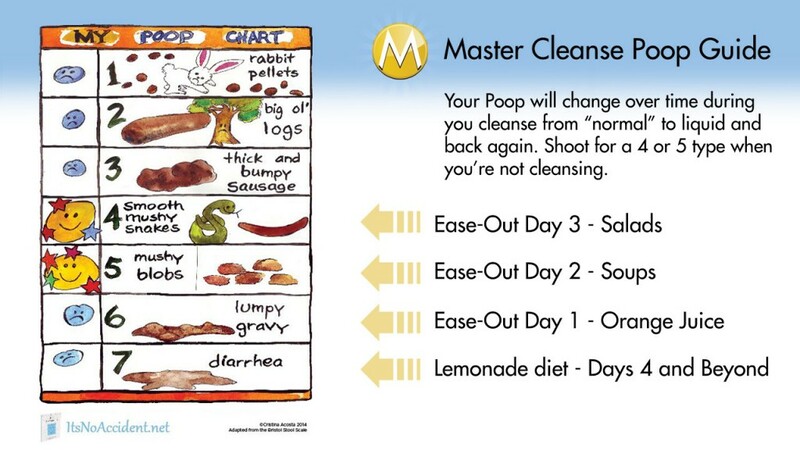 If you're doing one or both of these elimination methods and your still not moving at least once per day, then you're truly “master cleanse constipated”. You need to up dosages or correct mistakes in your procedure to ensure one of those methods works for you. Without them, all the toxins being stirred up form the lemon cleanser will be sitting in your intestines, making you sick and even more toxic. Parasite Poops: As the body becomes more alkaline from the lemon and the cayenne breaking up mucus an eliminating through our movements, the living environment for parasites and other microorganisms becomes hostile (I know, poor parasite). This makes the master cleanse an effective parasite cleanse, but when doing just the master cleanse and not another parasite cleanse as well, the process can take a long time, however many people do report seeing a parasite, come out whole, or in parts in their yellow liquid poop. Don't be surprised. Do be disgusted. And do send photos (but warn us first). Master Cleanse Poop Pictures: (What should my poo look like)? I am on day 12 and am still having some solid stool, which in previous cleanses I think it was all liquid and mucousy. Is this normal? Does that mean my intestines really needed a good cleaning? anyone know if i should do the sea salt flush in the morning then the Herbal smooth tea at night? i did it on my first day and Today is my 2nd day i woke up to clear my bowls and after i did the sea salt water flush i then drank my lemonade but i felt that i had to go poo more than usual i dont feel light headed its a yellowy liquid now im not sure if this is normal and if so do u think i should stop taking the herbal tea or alternate it since they both do the same and i dont want my insides going overboard can anyone tell me ur experinces in this matter ?? I hire to know when we have cleaned it all out? By day 2 I had liquid yellow mucous poo….I feel like there should have been more in the, it was my colon cleaner than anticipated? same its my 2nd day and i was worried cus i have been pooing alot i dont feel light headed or anything i took the herbal tea at night i went to the bathroom fine then took the salt water before i had the lemonade did a flush and have been on the lemonade but i do have some urges throughout the day to go poo more frequently is that normal i dont feel bad have similar looks to urs since on the lemonade i have only done it 2 more times im worried that im doing it to often *just incase* if so im not sure if i should take the herbal tea at night ? i am unsure if i should give it a rest and do the flush the next day like usual just alternate it ? anyone have any experince in this part? How do I know when all the mucoid plaque is out? Is there an unlimited amount or will I know its time to stop the master cleanse when it stops coming out? I’ve been suffering from Candida for the past year or so. I’m on day 4 of this cleanse, and today I’ve found myself passing a bit of waste with each urination, but, this time something was different. I went to look and saw a jelly-like, yellowish brown coated blob sitting in the bottom of my toliet bowl. I was curious so I decided to use a toliet wand to clean up the bowl and I poked it a bit and it reacts like discharge from Candida? DID I JUST PASS SOME YEAST BLOB OUT OF MY BOTTOM?! It was interesting. Just curious as to what the heck that was!!! That is likely just mucous from your intestine.